After a flawless, 12-0 start to her run as a professional mixed martial artist, Ronda Rousey‘s career was derailed by two brutal losses. The first came courtesy of Holly Holm, who put her down with a second-round head kick, while the second was dealt by Amanda Nunes, who put her away with punches in less than a minute. Given the way Rousey drew away from the limelight after these losses, it should come as no surprise to learn that she took them quite hard. Speaking quite candidly in a segment that aired during WWE Raw on Monday evening, Rousey opened up on these losses for the first time since… well, maybe ever. “I remember my last fight, walking away thinking ‘God hates me.’ I had nothing left in me,” Rousey said of her loss to Nunes (h/t MMAFighting.com). Though this loss was difficult for her to swallow, Rousey said her husband, UFC heavyweight Travis Browne, helped her keep her composure. Whatever the case, Rousey feels her path has always led to WrestleMania. 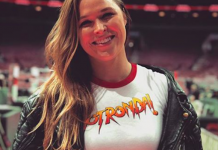 How do you think Ronda Rousey will perform at WrestleMania? 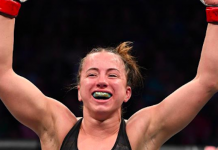 This article first appeared on BJPenn.com on 3/19/2018.